It’s just not fair to those of us who fight the injustice of experiencing skin problems from both ends of the problem skin spectrum: acne and aging skin. It’s a delicate balancing act to successfully address the oily excess of acne while not drying out the skin — especially as we age when we lose moisture and fine lines and wrinkles are more apparent. And who needs the awful combo platter of age spots and blemishes? It’s always my mission to tackle even the toughest skin care issues to help you achieve a clear, glowing complexion. To address the double whammy of acne and aging, AlphaHydro 10 has always been my go-to product — not to mention a bestseller. Still, I knew I could kick it up a notch, so for the first half of this year I have been testing a reformulated version and have seen amazing results with acne clearing, reduced appearance of fine lines and wrinkles and hyperpigmentation fading. I’m so excited to announce my newest product and next-level version of the old favorite AlphaHydro 10….drum roll, please… CytoClear+ serum is now available! Because I’m also all about educating you so you know what you’re using on your skin, here’s a bit more about this brand new serum, which features a specially formulated triple blend of Azelaic, L-Mandelic, and L-lactic acids. This potent player is your first line of defense to help fight acne, discoloration, and scarring, reduce inflammation and brighten your overall complexion. It also features Hyaluronic acid, which helps reduce the appearance of fine lines and wrinkles. 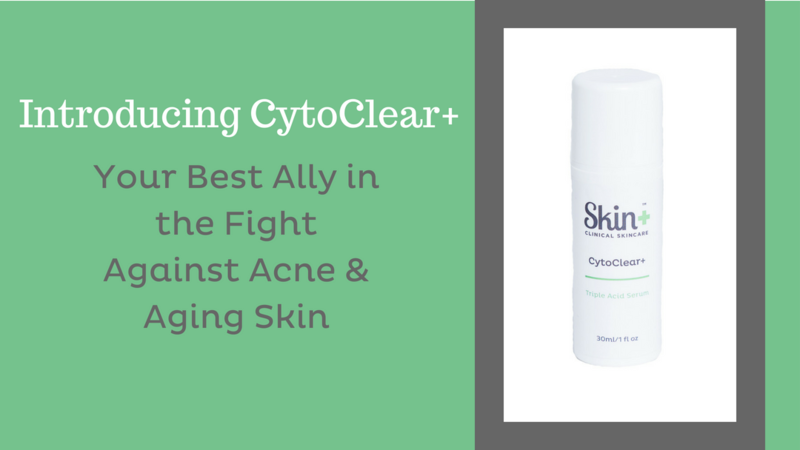 Altogether, CytoClear+ leaves your skin with an acne-free, healthy glow. L-Lactic acid is a powerful exfoliator and collagen-growth promoter, which is why it’s one of the most popular alpha hydroxy acids (AHAs) today. A natural acid derived from milk, fruit, vegetables and other plants, it not only reduces breakouts but it also lessens the appearance of wrinkles, premature aging from sun damage, fine lines, and hyperpigmentation. Because it’s relatively mild, it sloughs off dead skin cells without causing irritation and brightens the appearance of your face. L-Mandelic acid is a natural AHA that is unique among alpha hydroxy acids. It’s derived from almonds (so if you’re allergic to almonds, please avoid this product! ), which means it has a larger molecular structure so it doesn’t penetrate as deeply as some other AHAs and is generally less irritating. It’s an excellent exfoliator, does a great job unclogging pores and sports powerful antibacterial and anti-inflammatory properties, making it a great choice to address acne. Mandelic acid also includes a melanin inhibitor that helps reduce redness and scarring and softens the appearance of fine lines and wrinkles. For sensitive or darker skin tones, mandelic acid is a great choice because it has been shown to reduce hyperpigmentation and correct skin tones. Because it’s relatively gentle, it’s even safe if you have rosacea. Azelaic Acid completes the triple exfoliation power of CytoClear+ and is known to be super effective in treating mild to moderate acne, thanks to its antibacterial properties that work on the bacteria that causes acne, including as P. acnes and Staphylococcus epidermis. Derived from barley, rye, grains and wheat, Azelaic acid also significantly lessens factors in the skin that lead to redness and bumps and packs a powerful antioxidant punch. It also smooths out skin tone. Put ‘em all together, and add in the awesome hydration power of Hyaluronic acid, and you have a serum that fights bacteria, inflammation, skin discoloration, wrinkles and fine lines and other signs of aging. The perfect serum to the address two phases of life that shouldn’t overlap… but often do.. is now available. Please note that if you are allergic to almonds, this is not the product for you, and also, always use SPF to protect your skin from the sun as some of the active ingredients have increased sensitivity to UV rays. For more information or to try CytoClear+, CONTACT US.